Epact: Astronomical Compendium signed by Christoph Schissler, circa 1570 ? This elaborate astronomical compendium comprises among other devices a nocturnal, a volvelle for converting lunar and solar time, and a string gnomon dial. 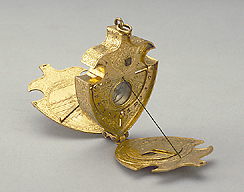 The dial can be adjusted for latitude with a very ingenious device, consisting of two curved bands sliding in grooves; a very unusual, if not unique, design. The whole instrument is also finely decorated with strapwork and foliage. It is very similar to another compendium in the collection of the British Museum: Epact 73378.